Yasin Malik, the 49-year-old frail chairman of the Jammu and Kashmir Liberation Front (JKLF), receives visitors lying on the floor of his traditional mud house like an injured but proud crane. Over the years he has been beaten so badly by the police that he finds it difficult to sit for long periods. This time around, he was beaten by the CRPF personnel when protesting in Anantnag. He wanted to sit on a 24-hour hunger strike to protest the lynching of Zahid Bhat, on the Jammu-Srinagar highway at Udhampur. Bhat, a cleaner in a truck hauling coal, was accused of transporting beef. Showing me the lacerations on his arm from manhandling by the security forces, he says, "There is no space left in this state for non-violent protests. The CRPF personnel not only beat me, they were extremely abusive, telling me: Leaderi karta hai? Hum seekhayenge tujhe leaderi kaise hoti hai (You want to be a leader? We will teach you what leadership is about)." "Then they proceeded to rain lathis on me while using the choicest north Indian abuses about my mother and sister." Malik, who undoubtedly enjoys mass support in Kashmir, was hit on the neck - he has to wear a collar-brace till a minor crack heals - and also suffered internal injuries. A blood clot, ostensibly from the beating, prevented him from urinating for 52 hours. He had to be hospitalised directly from police custody. "I told the CRPF men: you are not men because you don't talk like human beings. You are like dogs. That was enough for some TV channels in Delhi to run a half-an-hour programme saying I had called Indians dogs. What is going on? It is not clear at all what India wants in Kashmir," he says with a resigned smile. Malik claims that non-violent protests are not being allowed by the current state administration. "An entire new generation is being pushed towards militancy. Their hero is Burhan Wani who poses with an AK-47 on Facebook. The only thing that is keeping more youngsters from joining full-scale militancy is the lack of guns. They seize them from the police but there is a limit to doing that. So knife-wielding gangs of youngsters have come up," he says. One of his visitors points to Malik and Javed Mir, the leader of the rival JKLF faction who has come to inquire after his former comrade's health, and says, "Just as Yasin Sahib and Javed Mir Sahib with their guns were heroes of Kashmiri teenagers in 1989, Burhan Wani is today." Malik, who renounced violence in 1994 and chose the Gandhian path of political activism, says until about 2008, he was able to channelise the rage and the political energy of the youth towards non-violent protests. "The Safar-i-Azadi or the various sit-in protests I held were a way of channelling the political energy of youth away from violence and towards a democratic approach. Now, if you don't allow any avenue for non-violent political protest, how will you release the political pressure that is building up?" Malik asks. Yet, he says, he is being denied permission to organise protests, marches or sit-ins. "There is no one who can guide the youngsters towards a non-violent and democratic approach. What makes it even more difficult is that there is no dialogue of any kind going on between India and Pakistan or between India and the Kashmiri leaders," he says. The years since 2008 have been terrible in Kashmir, according to Malik. "The police have become more brutal. One of the reasons why those who used to only throw stones are picking up the gun is because of the way their family members were abused and beaten up unnecessarily by the police." "Teens are highly emotional and even if they are at fault, they do not want their father or mother to be beaten up or abused. They get so upset that their anger blinds them. They think they have no option but to pick up the gun." Malik says when he was recently in jail for three months in South Kashmir, he met "many of these youngsters" there. "They would ask me: 'you are in jail just like us. So tell us what has been the advantage of choosing the non-violent path?' I was like them once and I know how impatient an 18-year-old can be. The gun seems the easy option." "It took me many years of deep introspection and reading in jail to appreciate the virtues of non-violent democratic politics. I know how much time it takes to realise that violence is not the way to achieve a political goal." Malik seems convinced that the space for reasonable discussion on Kashmir and the issues of Kashmiris has shrunk because of the central government's policy to not start a dialogue with Pakistan or engage the separatist leaders, and because the Peoples' Democratic Party of Mufti Mohammad Sayeed feels insecure. For 68 years, India and Pakistan have talked to each other off and on about Kashmir, but that dialogue has not led to anything. "Dialogue about divisive issues is the best hope of the people in any democratic system. But once people see that dialogue also does not deliver anything, they start doubting its efficacy. That leads to hopelessness which is not easy to tackle," Malik says. "I cannot see the sense of negativity and cynicism that has now crept in Kashmiri society and the anger of the youth leading to anything positive." The JKLF chairman says those officers and intellectuals who understood Kashmir and its political mood have either retired or are dead. He thinks the new people in Delhi overseeing its Kashmir policy do not seem to understand the political temperament of the people and the changes it is undergoing. Malik believes that even the Indian civil society has shut its doors on the Kashmiris. "There was a time when civil society groups would invite Kashmiris to Delhi to participate in seminars or discussions and hear them out. We used to differ on issues but at least there was a discussion, some airing of our views - there was some release even if it was intellectual." 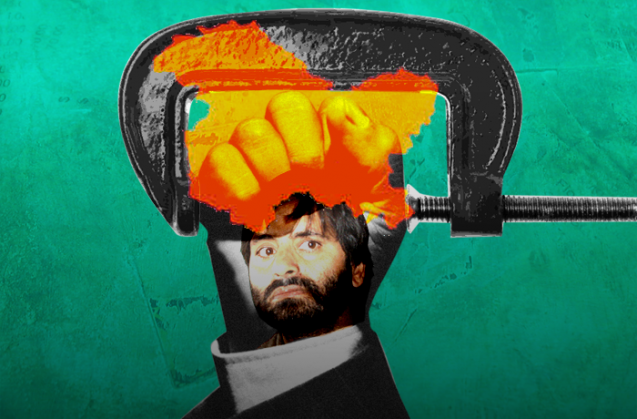 Yasin Malik: I don't know what the current regime in Delhi wants in Kashmir, do you? "Even that has stopped now. Alienation is bound to go up in Kashmir in such circumstances," he argues. "I don't know what the current regime in Delhi wants in Kashmir, do you?" he asks rhetorically.